Ideas are important, but they're also cheap and completely useless by themselves. Understand, document and improve on the logistics required to run Grit with hundreds of students in order to help other groups replicate what we are doing. Track the academic performance of over 450 students from PIO as they use the mobile learning lab and hopefully see an improvement when compared to control groups (other PIO schools in the city). Grit Labs will use 8 Android tablets preloaded with over 100 free or low cost applications and videos. Our focus will be on Math and English as a second language content for all ages. We are actively working on translating and subtitling 100 of the most relevant Khan Academy videos into Khmer (the Cambodian language) and making these available on the tablets. Over time we will also introduce Cambodian content as well as material to encourage creative thinking, critical thinking, problem solving and group work. Students will come into the lab to use tablets under the supervision of an administrator - or their class teacher. Students will use the tablets in groups of 2-4 students per tablet and choose from content that they are most interested in. They will have up to 1 hour per session and use the facility on a roster basis. 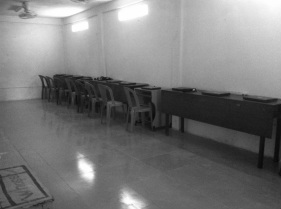 The lab will be used by kindergarten, primary and high school students. We may also experiment with weekend classes to allow for adult learners and children who are not enrolled in a school. Content on the tablets will be updated regularly based on our observation of what appears to be effective, interesting and relevant. Gradually we will develop custom software to control the content, provide formative assessment and incentivise students to use specific applications that we know are more effective at producing learning outcomes. Everything we learn from Grit Labs, we will share freely with anyone who is interested. We plan to publish a handbook with step by step instructions on how to set up a low cost digital learning lab with our recommendations on hardware, software and content for different topics and skill levels. We are also expecting that we will need to build custom software to provide a more structured learning environment and track learner performance in order to continually provide relevant content. We will also make this freely available. If you have ideas about what we should try at Grit Labs, or if you're able to help with your skills or with a donation - please drop us a line. The room where we will set up Grit Labs. Translating Khan Academy videos into Khmer at PIO school. Some of the many students who will participate in Grit Labs.